LaunchTec is a revolutionary replacement blade for Trophy Taker 1 & 2 hole, available in Ex narrow, narrow and wide versions. Also now available for the AAE Freakshow in Ex narrow, narrow and wide and also Beiter Ex narrow, narrow and wide. Over the years archery, and in particular compound bow archery has become increasingly technical and complex. Modern archers use advanced launcher blades in their arrow rests to improve their accuracy and consistency from arrow shot to arrow shot. N.B. 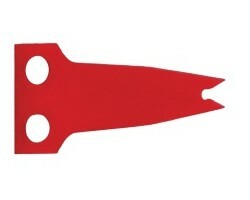 The wider blades, which have to cope with both heavier point weights and/or up to 5"arrow overhang are now available. They are equivalent to 12 thou steel. LaunchTec blades will also fit Spot Hogg and all others rests that use the Trophy Taker blades, such as the Mac Apollo, Cartel Midas 2 and Bodoodle Timber Rattler 2 rests. Care should be taken if using some Spot Hogg rests as the leading edge is sometimes sharp, which can damage the softer blade, just give the edge a rub with some emery paper and make sure you don't over-tighten the fixing screws as they are smaller than the Trophy Taker screws. 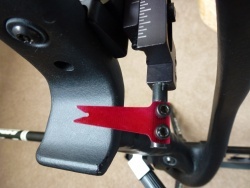 *Attention* If you have the Spott Hogg Edge rest, please change the countersink screws to 4-40 UNC buttonhead, as the countersink will damage our blade causing it to fail.